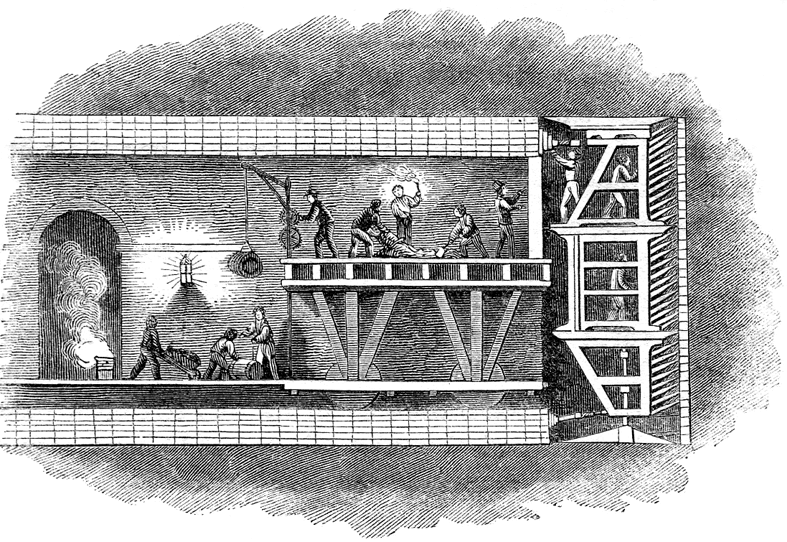 Labourers working at the face of the Thames Tunnel were protected by Marc Brunel’s newly-invented “Shield”; behind them, other gangs hurried to roof the tunnel before the river could burst in. Nineteenth century lithograph. At the beginning of the 19th century, the port of London was the busiest in the world. Cargoes that had traveled thousands of miles, and survived all the hazards of the sea, piled up on the wharves of Rotherhithe—only for their owners to discover that the slowest, most frustrating portion of their journey often lay ahead of them. Consignments intended for the southern (and most heavily populated) parts of Britain had to be heaved onto creaking ox carts and hauled through the docklands and across London Bridge, which had been built in the 12th century and was as cramped and impractical as its early date implied. By 1820, it had become the center of the world’s largest traffic jam. It was a situation intolerable to a city with London’s pride, and it was clear that if private enterprise could build another crossing closer to the docks, there would be a tidy profit to be made in tolls. Another bridge was out of the question—it would deny sailing ships access to the deepwater dock known as the Pool of London—and ambitious men turned their thoughts to driving a tunnel beneath the Thames instead. This was not such an obvious idea as it might appear. Although demand for coal was growing fast as the industrial revolution hit high gear, working methods remained primitive. Tunnels were dug by men wielding picks in sputtering candlelight. No engineers had ever tunneled under a major river, and the Thames was an especially tricky one. To the north, London was built on a solid bed of clay, ideal tunneling material. To the south and east, however, lay deep strata of water-bearing sand and oozing quicksand, all broken up by layers of gravel, silt, petrified trees and the debris of ancient oyster beds. The ground was semi-liquid, and at depth it became highly pressurized, threatening to burst into any construction site. Richard Trevithick, the Cornish engineer who made the first—disastrous—attempt at a Thames tunnel. Today, engineers deal with treacherous ground by pressurizing their workfaces (though that solution still leaves tunnelers vulnerable to the problems that come from working in high-pressure environments, including bone-rot and even the bends). In the early 19th century, such measures were still decades away. The first men to attempt a tunnel beneath the Thames—gangs of Cornish miners brought to London in 1807 by businessmen banded together as the Thames Archway Company—had little to guide them. The chief engineer of this first tunnel project was a muscular giant named Richard Trevithick, a self-educated man who had progressed from youthful fame as a Cornish wrestler by displaying a dazzling talent for invention. Trevithick had harnessed steam power to drive the first self-propelled engine to run on rails and designed the world’s first high-pressure steam engine. He was convinced that a tunnel could be hacked out under the Thames relatively easily. It did not take long for him to realize he was wrong. Trevithick’s men made fine progress while tunneling through London clay, but once they got under the Thames they had constant trouble. Their pilot tunnel was just five feet high and three feet wide, and sewage-laden water seeped in from the river, thirty feet above their heads, at the rate of 20 gallons a minute. Within this narrow space three miners worked on their knees, one hewing at the face with his pick, another clearing away the sodden earth, the third shoring up the drift with timbers. Working conditions during the six-hour shifts were appalling; the men were soaked with sweat and river water, no one could stand or stretch, and the tunnel was so poorly ventilated that the fetid air sometimes extinguished the candles. 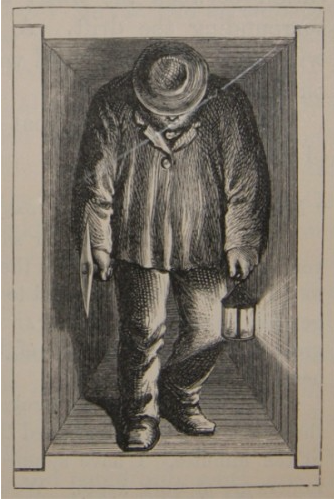 A Cornish miner in Richard Trevithick’s cramped driftway. Nevertheless, the Cornishmen made progress, and by January 1808 Trevithick reported that his drift was within 140 feet of the north bank of the Thames and that the pilot tunnel would be completed in a fortnight. Then things began to go disastrously wrong. The miners hit quicksand, then water, this time in such quantity that nothing could stop waterlogged soil from gushing into the driftway. The men at the face fled the shaft just ahead of the flood. Correctly guessing that his tunnel had come too close to an unexpected depression in the bed of the Thames, Trevithick arranged for the hole to be plugged with large bags of clay dumped into the river. To the astonishment of his detractors, this seemingly desperate measure worked, and the tunnel was pumped dry. Within days, however, it flooded again, and this time the Thames Archway Company had had enough. Its funds were exhausted, its chief engineer was sick from exposure to the river water, and all its efforts had proved only that a passage under the river at Rotherhithe exceeded the limits of contemporary mining technology. At that time, the only machines used in mines were pumps. It took a man of genius to recognize that a different sort of machine was needed—a machine that could both prevent the roof and walls from collapsing and hold back any quicksand or water at the tunnel face. 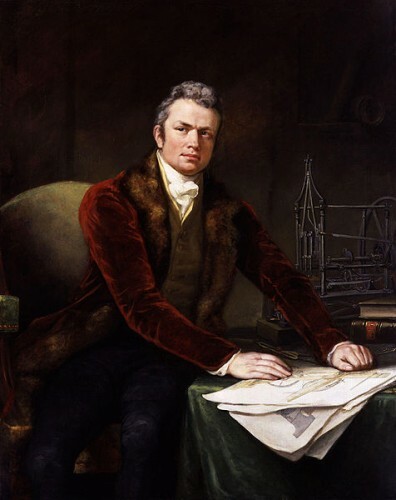 This man was Marc Brunel, an emigré who had fled his native France during the Revolution and quickly made a name for himself as one of the most prominent engineers in Britain. Brunel was a tiny, eccentric man, impractical in his private life but an intensely able innovator. His inventions, which had brought him to the attention of men as illustrious as Tsar Nicholas I of Russia, included machines for mass-producing cannon balls, embroidering fabric, sawing wood and making ships’ tackle. This last had cut the cost of producing rigging pulleys by 85 percent. After he secured a number of contracts to supply pulleys to the Royal Navy, the Frenchman found himself relatively wealthy despite his lack of business acumen. Marc Brunel, father of the celebrated shipbuilder and railway engineer Isambard, was a notable engineer in his own right. Not long after the failure of the Thames Archway Company, Brunel happened to be wandering through the Royal Dockyard at Chatham when he noticed a rotten piece of ship’s timber lying on the quay. Examining the wood through a magnifying glass, he observed that it had been infested with the dreaded teredo, or shipworm, whose rasping jaws can riddle a wooden ship with holes. As it burrows, this ‘worm’ (it is actually a mollusk) shoves pulped wood into its mouth and digests it, excreting a hard, brittle residue that lines the tunnel it has excavated and renders it safe from predators. Though he had no prior knowledge of, or interest in, the subject, Brunel realized that the shipworm’s burrowing technique could be adapted to produce an entirely new way of tunneling. His insight led him to invent a device that has been used in one form or another in almost every major tunnel built during the last 180 years: the tunneling shield. Brunel’s invention consisted of a grid of iron frames that could be pressed against the tunnel face and supported on a set of horizontal wooden planks, called poling boards, that would prevent the face from collapsing. The frames were divided into 36 cells, each three feet wide and almost seven feet tall, and arranged one atop another on three levels. The whole machine was 21 feet tall, and the working surface was 850 square feet—68 times bigger than Trevithick’s. It was topped by sturdy iron plates that formed a temporary roof and protected the miners as they worked. Instead of hewing away at a large and exposed surface, they would remove one poling board at a time and hack out a mailbox-shaped hole to a predetermined depth—say nine inches. Then the board would be pushed into the hole and screwed back into place before the next one was removed and the whole process begun again. When the miners in a cell had excavated the earth behind all of their boards, their frames could be laboriously jacked forward those nine inches. In this way, the whole 90-ton tunneling machine could move inexorably and safely on while masons trailed behind, shoring up the newly exposed tunnel with bricks. 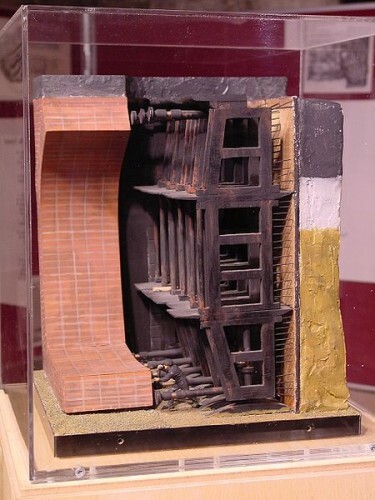 A model of Marc Brunel’s tunneling shield on display at the Brunel Museum at Rotherhithe, London. 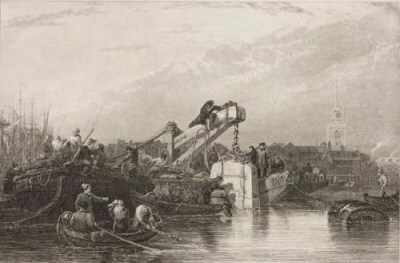 The prospect of tunneling beneath the Thames promised a lucrative test of Brunel’s new invention, and he raised funds for the project through a public subscription. Soil samples were taken beneath the riverbed, and Brunel was advised to stick close to the muddy river bottom, where he could expect clay, rather than risk striking quicksand by going deeper. When he began work on his tunnel in 1825, the shaft that was sunk in dingy Rotherhithe was only 42 feet deep, and it was planned to pass within seven feet of the river bed in places. The hazards of such an operation soon became apparent. Although the shield worked well and the miners dug, at first, through the predicted clay, water began to drip into the tunnel before the shaft had even begun to pass under the Thames. This influx was more of a nuisance than a real danger while the pump was working, but in the summer of 1826 it failed, and the whole shaft was soon flooded to a depth of 12 feet. From then on the project proved ever more difficult. Brunel’s machine could cope with the sodden mud and dry gravel that his miners encountered nearly as well as clay, but he ran short of funds. The economies that followed left the shaft was poorly drained and ventilated, and miners were poisoned by the polluted river water or afflicted by illnesses ranging from diarrhea and constant headaches to temporary blindness. Most of Brunel’s workers complained of feeling suffocated and tormented by temperatures that could plunge or rise by as much as 30 degrees Fahrenheit within an hour. One miner died of disease. In May 1827, with the tunnel now well out into the river, the ground behind the poling boards became so liquid that it forced its way through the gaps between the boards; a gusher in one of the cells bowled the miner working in it head over heels. The rest of the 120 men working in the shield could not force their way into his frame in time to staunch the flow. Bitter-tasting, gurgling water rose rapidly and flooded the tunnel, sending all the miners scurrying for their ladders and the surface. The diving bell used by Brunel to plug a hole in the bottom of the Thames. Work at the face began again late in 1827, but within months the shield was advancing through treacherous ground once more. 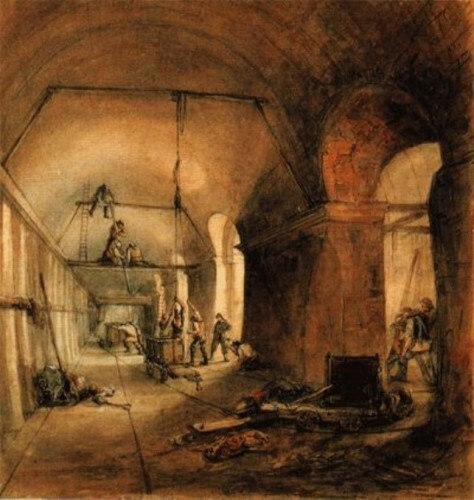 Early in the morning of January 12, 1828, the miners in one of the top cells were hacking away when another unstoppable torrent of water flooded into the tunnel. Once again the men in the shield had to run for safety, but this time they had left it too late; six miners were drowned. Just as seriously for Brunel, the cost of tipping a further 4,500 bags of clay into the Thames to plug this latest hole in the river bed exhausted his company’s funds. With no new financing in the offing, the tunnel was pumped dry, the shield was bricked up and the tunnel was abandoned. It took Brunel and his supporters seven years to cajole the government into advancing a loan of £246,000 to allow work on this “project of national importance” to be completed. And despite the replacement of the old tunneling shield with a new model better able to resist the pressure of the Thames as it swelled with each high tide, it took six more years of round-the-clock labor before the tunnel finally emerged at Wapping on August 12, 1841. Work on the 1,200-foot tunnel thus occupied 16 years and two months, an average rate of progress (allowing for the seven-year layoff) of only 4 inches a day—a good measure of how sorely the project tested the technology of the day. The interior of the tunnel was later occupied by vagrants and known grimly as “Hades Hotel”. Brunel’s triumph was only partial. Once again his company’s funds were at a low ebb, and the tens of thousands of penny-a-head visitors hardly paid the interest on the government loan. There was never enough to complete the approaches to the tunnel and make it accessible to horse-drawn vehicles, as intended. Instead, the passageways were filled with souvenir-sellers by day and by the city’s homeless at night. For a penny toll, vagrants could bed down under Brunel’s arches in what became known as the Hades Hotel. It was only when the underground railway came to London in the 1860s that the Thames Tunnel achieved a measure of real usefulness. Purchased by the East London Railway in 1869, it was found to be in such excellent condition that it was immediately be pressed into service carrying steam-driven trains—at first along the Brighton line and later from Wapping to New Cross. The tunnel became, and remains, part of the London Underground network. It is a tribute to Trevithick and Brunel—and mute testimony to the difficulties of tunneling in London—that it remained the only subway line so far to the east until the opening of the Jubilee Line Extension in 1999. Anon. The Thames Tunnel. London: Henry Teape, 1825; Richard Beamish. Memoir of the Life of Sir Marc Isambard Brunel. London: Longman, Green, 1852; H.W. Dickinson and Arthur Titley. Richard Trevithick: The Engineer and the Man. Cambridge: Cambridge University Press, 2011; James Hodge. 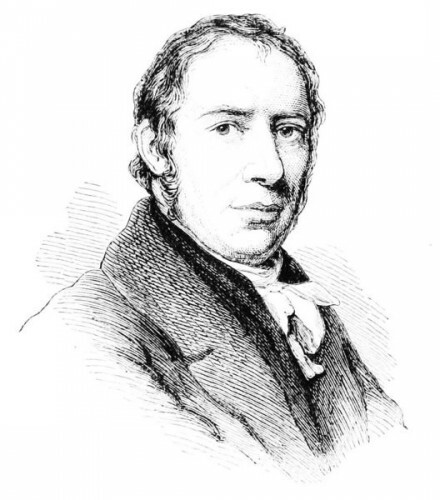 Richard Trevithick: An Illustrated Life. Princes Risborough: Shire Publication, 2003; Charles Knight. Pictorial Half-Hours of London Topography. London: The Author, 1851; David Lampe. The Tunnel: the Story of the World’s First Tunnel Under a Navigable River. London: Harrap, 1963; Gosta Sandstrom. The History of Tunnelling: Underground Workings Through the Ages. London: Barrie & Rockliff, 1963; Barbara Stack.Handbook of Tunnelling and Mining Machinery. New York: Wiley, 1982. I would probably have found it of interest by itself, but it also sheds a bit more light on a local hero from my home town in Cornwall – Richard Trevithick. It strikes me that he was a bit like Charles Babbage who came up with the idea of a computer; the resources of the time were not enough to accomplish his ideas. Makes you wonder if there are geniuses out there nowadays who look like failures because the facilities to implement their ideas just aren’t available at the moment. I got stuck at Raw Sewage… yuck. I walked under the river when I visited London. If the transit of carts was enough to clog up the only bridge in the 1820’s, how come the tunnel sat unused until the 1860’s and then only used for railways? I imagine the volume of cargo being transported across the river had increased significantly during this time. Now did they manage not to flood the while city in oxcarts? It’s certainly a strange story. The tunnel was the product of private enterprise, and it took vastly longer to dig than anticipated – almost 20 years. All this meant that the company responsible ran out of money before it could complete all the work; there was no money left to construct the ramps needed to allow carts access to the crossing, so when it opened, it did so solely to people who crossed on foot. Even so, the novelty value ensured that it was London’s most successful tourist attraction for a while; a million people, half the population of the capital, paid a penny apiece to walk under the river in the tunnel’s first six months. By my calculation, that comes to revenues of £2,083 – even in the 1840s, far from enough to fund the works necessary to complete the tunnel to Brunel’s original design.